Okay, now that may be excessive, but I'm not going to stop her. 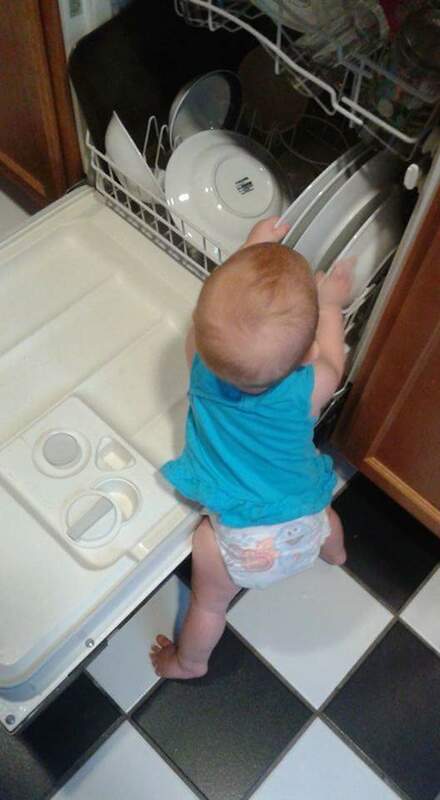 Except when she actually does get strong enough to pull those plates out of the rack. I will end up with a bunch of broken plates if that's the case. I did however start Morrigan with choirs at age 4. It was simply dusting the surfaces in the living room. I may have had to go back over everything but it gave her a sense of pride not only in her self but also the home she lives in. I can't say she kept that sense of cleanliness as her room always looks like a tornado just ripped through it. But what I do see is a pride in the communal living areas like the living room and dining area. She treats my furniture with care. Choirs should not be used as punishment but rather a teaching tool. Teach your kiddos the value of pride in their home and you will raise children that are respectful of your house and the stuff you have that makes it a home.